"She's only a little scrap of a woman, but she can call on such extraordinary physical strength!" That's the main comment found in articles written in Britain about Rosie Stancer (born 1960). Although frail in stature (5'4" or about 1.55m), Rosie took up the kind of sports that require sustained effort when she was very young, indulging in events such as cross-country running and even marathons. She also acquired an early taste for dangerous sports and became the first woman to bungee jump in the UK. Doubtless her family background was a determining factor in deciding her to go and chance her arm in taking up challenges in polar climes. Her grandfather just missed out on being part of the great Robert Falcon Scott's conquest to the South Pole: he was deemed to be too tall to fit comfortably with the other men in the tent chosen for the expedition! And Rosie's husband's grandfather, Sir James Wordie, also explored the Antarctic alongside the famous Sir Ernest Shackleton. Women at the North Pole. 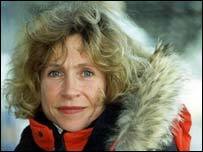 In 1997, Rosie Stancer was one of the 20 amateur women selected for the first all-women expedition to the North Pole, the 'McVities Penguin Polar Relay'. Five teams of four women took it in turn to reach the North Pole. It took them 73 days of intense effort, but they made it! The aim of the expedition was to raise money for the St John Ambulance organisation. Five women at the South Pole. Two years later, in 1999, Rosie and four other women (Caroline Hamilton, the expedition leader, Ann Daniels, Zoe Hudson and Pom Oliver) organised and managed the M&G ISA Challenge, a women-only expedition to the South Pole. They reached their goal without the aid of a professional guide, being re-supplied only once along the way. This expedition was in aid of the British Special Olympics. Solo to the South Pole. This solo, unassisted trek between Hercules Inlet and the South Pole took place during the 2003-2004 Antarctic season and was sponsored for the second time by the Royal Patron, HRH The Prince of Wales. She reached her objective after 43 days and 23 hours, beating the previous speed record by over 7 days. The same year, even this amazing feat was eclipsed by another Briton, Fiona Thornewill, who shaved two days off Rosie's time, completing the same route in 41 days and 8 hours (see her biography). Solo to the North Pole. In the spring of 2007, Stancer attempted to reach the North Pole solo and unassisted. Her aim was to become the first woman to do so. But after experiencing and surviving incredible difficulties and having covered almost all of the route, Rosie was forced to abandon her attempt when she only had a hundred or so miles to go (see our reports).